T Jake Fisher vs. 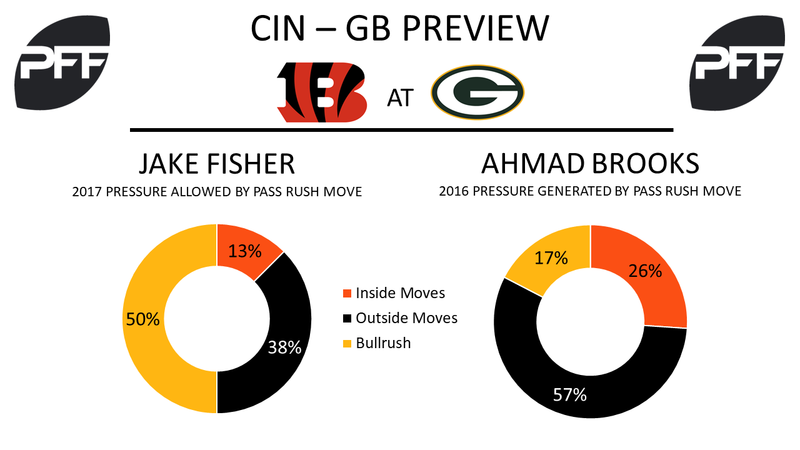 EDGE Ahmad Brooks – Pass protection has been an issue for Fisher this season, allowing one hit and seven hurries through the first two games. His 39.2 pass blocking grade ranks 54th out of 69 offensive tackles this season, and he’ll face the veteran Brooks who should have a bigger role filling in for the injured Nick Perry. Brooks is coming off of the two lowest-graded seasons of his career in 2015 and 2016. Last year, he put up four sacks, three hits and 31 hurries on 362 pass-rushing snaps, meaning he generated pressure on 10.2 percent of his rushes, which ranked 39th out of 57 3-4 outside linebackers. WR A.J. 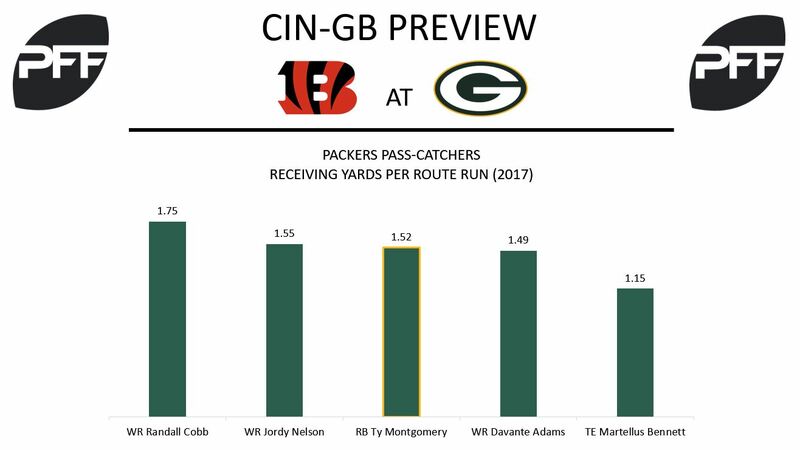 Green vs. CB Kevin King – King put together a strong performance last week in his first game seeing significant snaps, and he currently sits as the Packers’ highest-graded defensive back this season at 82.0 overall. Against the Falcons, he was targeted five times, allowing one catch for 12 yards. He was targeted twice when covering Julio Jones, and he made a pass defense while allowing him zero catches. The rookie will have another tall task with Green this week, who has had a subdued start to the season by his standards. Andy Dalton has had just a 57.2 quarterback rating when targeting his No. 1 weapon, ranking 67th out of 81 wide receivers. Green is averaging 1.96 yards per route run, though, good for 20th at his position. WR Brandon LaFell vs. CB Damarious Randall – LaFell hasn’t stepped up as a consistent No. 2 option for the Bengals offense yet this season, and his 45.1 overall grade ranks 92nd out of 107 wide receivers. His 0.76 yards per route run is good for 74th at his position, and his passer rating when targeted is down to 34.7. He could have a favorable matchup this week against Randall, who is having his own struggles. His poor 34.6 overall grade puts him 104th among 106 cornerbacks, and he’s allowed a passer rating of 108.3 when targeted this season, missing three tackles along the way. 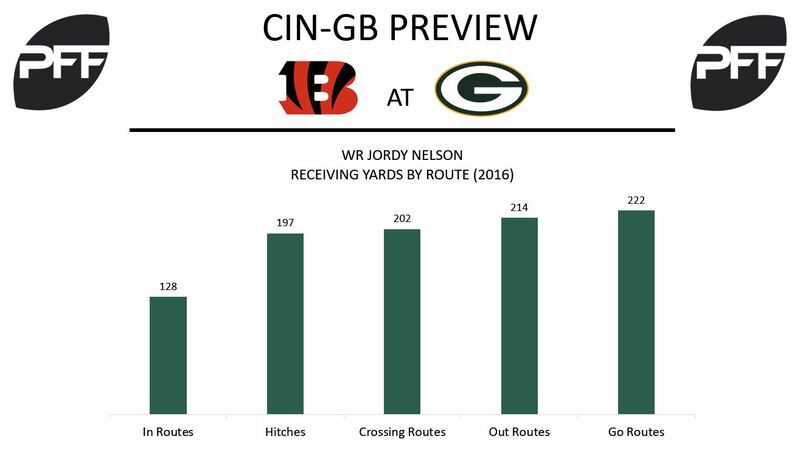 WR Jordy Nelson vs. CB Dre Kirkpatrick – Packers wide receiver Jordy Nelson is expected to play against the Bengals Sunday after missing most of Week 2 with a quad injury. In his Week 1 matchup against the Seahawks, he led the Packers with a wide receiver rating of 147.4. He also averaged 1.68 yards per route run and caught all seven of his catchable targets in the win. This week, he’ll likely be matched up against Bengals cornerback Dre Kirkpatrick for most of his routes. Kirkpatrick has allowed two catches on four passes into his coverage for 13 yards this season. His .26 receiving yards allowed per coverage snap ranks fifth out of 109 qualified cornerbacks. From Week 1 of last season through Week 2 of this year, quarterbacks targeting a player in Kirkpatrick’s coverage have averaged a passer rating of 67.0. G Lane Taylor vs. DI Geno Atkins – Packers left guard Lane Taylor will have his hands full against Bengals defensive tackle Geno Atkins. Atkins is PFF’s fourth-highest ranked interior defender with an overall grade of 89.5. He’s forced nine total pressures and he ranks second among interior defenders with a pass-rush productivity of 20.3. Atkins also has a run-stop percentage of 8.9. Taylor has given up a team-high eight total pressures. However, none was a sack or a hit. His PFF run blocking grade of 57.0 ranks 32nd out of 64 qualified guards. HB Ty Montgomery vs. LB Nick Vigil – Packers running back Ty Montgomery ranks second at his position with a PFF receiving grade of 86.6. While he occasionally splits out on passing plays, eight of his 10 catches have come on routes out of the backfield. His 132 yards after the catch were the most in the league for all positions through the first two weeks. Bengals linebacker Nick Vigil has allowed six catches on eight targets in his coverage for 71 yards this season. His 1.54 receiving yards allowed per coverage snap is tied for the seventh most among linebackers.